Handmade Christmas decorations and simple craft ideas are about peaceful time and creativity. Easy to make, unique and inexpensive homemade Christmas decorations feel nostalgic and warm, offering comfortable Christmas decorating ideas and saving time and energy for celebrating Christmas in peaceful and relaxing atmosphere. Handmade Christmas decorations, made of items that clutter you home, help get rid of useless and old ornaments, recycle plastic bottles, old table decorations and used clothes, creating better homes. Homemade Christmas decorations, made of natural materials, like pine cones, dried fruits or nuts are excellent for eco homes. Christmas decorating, shopping and planning a Christmas party take a lot of energy. Handmade Christmas decorations and simple craft ideas offer the easiest way to relax and create festive atmosphere in your stress free home. 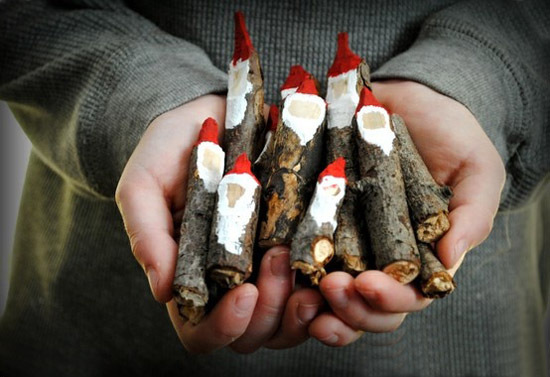 Here are fun Christmas craft ideas that are cute, quick and easy to make. Bright handmade Christmas balls are simple and easy to make. 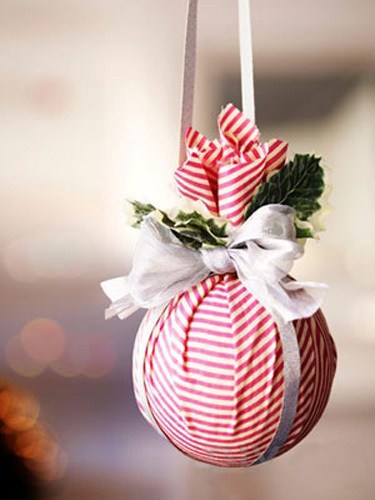 Wrap an old Christmas ball, used tennis ball or any plastic ball with a square piece of colorful decorative fabric in colors that match your Christmas tree decorating. Use the rubber band to hold fabric. Decorate handmade Christmas balls with ribbons, a small evergreen branch and a bow, using the rubber band to hold them together. Beads and embroidery are wonderful for Christmas decorations that add elegant chic to homemade Christmas decor and emphasize Christmas decorating theme. Ordinary candles can be transformed in beautiful Christmas table decorations. produce a nice and original decorations. Candles on a plate, decorated with green Christmas wreath make gorgeous Christmas table centerpieces. Wreaths, made of evergreen branches bring wonderful Christmas aroma into a room and excellent Christmas table decoration that stay fresh and attractive for long time. The tablecloth and table runner can be decorated with tiny jingle bells and ribbons in Christmas colors. 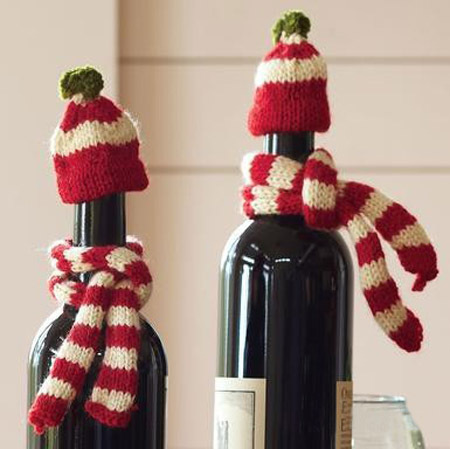 Small jingle bells add playful flavor and festive atmosphere to Christmas decorating. Jingle bells are great festive accents that are easy to add to homemade Christmas decorations, curtains, window and door garlands, chandeliers and door knobs. Old mittens or mittens, knitted for Christmas decorating, make gorgeous Christmas gifts and handmade Christmas decorations. You can decorate door knobs ad walls, windows and dining chairs, curtains and chandeliers with mittens, small pine branches and pine cones, ribbons and toys, beads and paper snowflakes, adding unique character to your home Christmas decor. 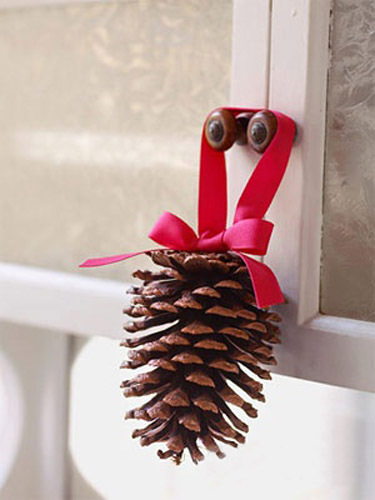 Pine cones are great for exterior and interior door decorating and creating lively handmade Christmas decorations for cabinets doors. Pine cones look gorgeous on walls, decorative pillows, throws or living room sofa skirt and work well for curtains rods and tablecloth corners decoration. Glass vases, bowls and jars with walnuts or chestnuts, wild rose or rowan tree berries, cranberries or holly tree berries, citrus fruits and evergreens create stunning Christmas centerpieces, that add wonderful fresh aroma to Christmas home decorating. Decorated with colorful ribbons or old Christmas cards, white, silver, golden and blue paper snowflakes or feathers, ordinary paper bags become eye catching Christmas table centerpieces. LED Christmas lights will add beautiful glow at night to these simple and elegant handmade Christmas decorations. Small cut outs in the shapes of stars, or just tiny punched holes will make ordinary paper bags look gorgeous and festive.